Jaitley said he was reacting to political aspects of the case and cited the details of the allocation policy of the UPA government and the SC verdict in February 2012 quashing all allocations. 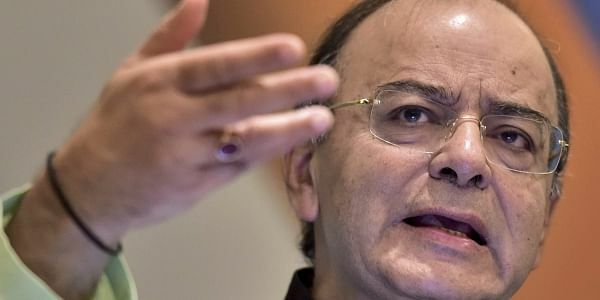 NEW DELHI: Finance Minister Arun Jaitley today cited a Supreme Court verdict to assert corruption in the UPA government's 2G spectrum allocation policy, and mocked the Congress by saying it was treating a trial court's acquittal of the accused in the case as a badge of honour. With the Congress going on the offensive following the judgement, Jaitley said today's verdict held that nobody was guilty in the case and investigation agencies would take an appropriate decision, taking facts and history into account. The Enforcement Directorate has already said it will appeal against the judgement while a CBI spokesperson said it would study the verdict and take a decision over it soon. "Its history is of corruption. Facts have proven it. Congress leaders are treating the judgement like a badge of honour and certification that the 2G spectrum allocation policy was an honest policy," Jaitley told reporters in the Parliament house complex. The minister said he was reacting to political aspects of the case and cited the details of the allocation policy of the UPA government and the Supreme Court verdict in February 2012 quashing all allocations. Citing the verdict, he said that it was a corrupt and dishonest policy intended to promote corruption was upheld by the apex court. Each allocation was quashed as arbitrary and unfair, he said. The criminal case was launched on the Supreme Court's order, he said. Jaitley also rejected former telecom minister Kapil Sibal's "zero loss" claim in the allocation, saying it was disproved by the subsequent allocation by the BJP-led NDA government, fetching Rs 1.10 lakh crore in 2015 and Rs 66,000 crore in 2016. Sibal fired a fresh salvo at the BJP following the trial court order today. The UPA government had fixed a price of Rs 1,734 crore per licensee, the finance minister said. Attacking the Manmohan Singh government, Jaitley said it had given licences in 2007-08 on the basis of a price linked to 2001 and there was a "huge element of arbitrariness" in the implementation of the policy. Cut-off dates were advanced and the first come first served policy was intended to serve a select few, he said, adding that it was later changed to "first come first pay" and a select few were informed in advance. It was proved by the fact that they had got bank drafts prepared on back dates, he said. The CBI had alleged in a chargesheet filed in April 2011 that there was a loss of Rs 30,984 crore to the exchequer in the allocation of 122 licences for 2G spectrum, a second- generation cellular technology. The allocations were scrapped by the Supreme Court on February 2, 2012.